Home / Kiddie Music Time / Children’s music class.. spring session starting on May 10th! Hello Kiddie Music Time friends! We hope that you are having a fun and happy Springtime! For those of you who don’t know, “Kiddie Music Time” is Monument Square Music’s group children’s music class for ages 1-5. Classes are held at Monument Square Music School’s studios right in downtown Leominster. The spring semester of Kiddie Music Time’s weekly Saturday classes start on May 10th at 11:00 am and run through June 14th. That’s 6 weeks of music fun and learning! We have a ton of new games and songs in store for this session to give kids a fun introduction to music. We always concentrate on developing rhythm, melody, harmony, and dance along with encouraging a love and appreciation of music that will last a lifetime. Kids learn music by jamming out, dancing and singing to a live pianist and the class is lead by Monument Square Music’s voice teacher, Stephanie Rogers. Stephanie Rogers and the pianist Joe Mazzarella compose much of the music, making Kiddie Music Time a unique experience for parents and children alike. What a great way to spend time with your kids! Please contact us soon if you plan on signing up your children for the class and we can register you by phone. You can also register by clicking on this link Kiddie Music Time Registration, and filling out the form. We look forward to seeing you all soon, and can’t wait for the fun to begin! 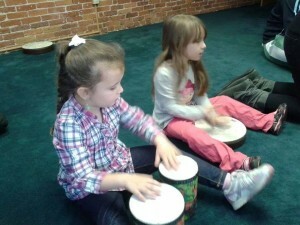 Kiddie Music Time students in action, jamming out the groove!